French president Emmanuel Macron was criticised on Monday after critics said he failed to express compassion for an elderly woman who was severely injured as she protested with the gilets jaunes (yellow vests) last Saturday. Geneviève Legay, 73, was marching in her capacity as a spokeswoman for the rights group ATTAC France, which fights for social and environmental justice. While marching, she fell when police closed in on protesters at the march on Garibaldi square in Nice, southern France. She remains in hospital with a fractured skull. On photos and in footage of the march, Legay was seen on the ground, unconscious, as police walked stepped over her to get to other protesters who had fled. "I hope she gets well quickly", French president Macron said on Monday, adding: "I also hope she [develops] some wisdom. When someone is fragile and is at risk of being knocked down, they should not go and participate in forbidden marches and put themselves in situations like this one." Legay was filmed on Saturday at the beginning of the march in Nice by French media CNEWS. 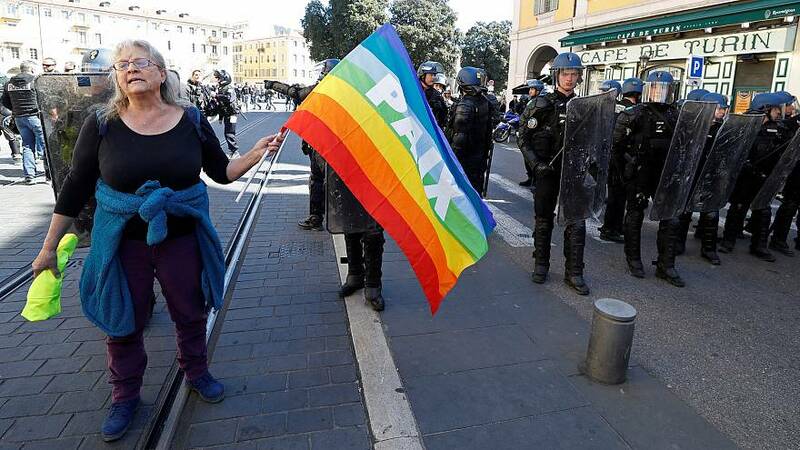 Brandishing a multicoloured flag that she described as a "peace flag", she explained that she was an "ecologist, feminist, anti-racist activist," who supports the giles jaunes movement. She added that the group had not been told by authorities that their meeting was illegal. "We are not here to attack the Chinese or the French president, but to march peacefully, to demonstrate our right to protest." Legay said chants from protesters drowned out calls from the police to retreat, adding she had spoken to policemen to "touch their hearts because they are human beings too ... they are just 'doing the dirty work'." When asked if she was scared of police violence, Legay said: "No, I'm not afraid, I'm 73," what could happen to me?" "This is revelatory of the French government's downward slide: they think they can answer the protesters' demands simply with repression. It's a serious mistake," Raphaël Prado, a fellow member of ATTAC France and a friend of Legay's, told Euronews. Legay's family filed a complaint on Monday for voluntary violence by public authorities on a vulnerable individual, according to AFP. ATTAC France also filed a complaint citing voluntary violence by public authorities on a vulnerable individual, the group said on Monday. "ATTAC France condemns the repression of peaceful meetings that occurred last Saturday and is outraged by the serious restrictions on public freedom that the French authorities enforced," a press release from the group read. "Repression and police violence will not help Emmanuel Macron to respond properly to demands for more social justice, which are being expressed everywhere around the country. "ATTAC France asks that the responsibility for the violent acts against Geneviève Legay be clearly established." ATTAC France has organised a peaceful meeting on Monday evening in Nice in Geneviève Legay's name. The Nice prosecutor has opened an investigation into the circumstances of Legay's fall at the march. At a press conference on Monday, the Nice prosecutor, Jean-Michel Prêtre, said that Geneviève Legay was "in a crowd with people moving, retreating, from the police" at the time she fell on the ground. He said: "What we are certain about, after closely looking at the images, is that she has not been touched by the police - not by a shield or an officer." He added that the police officer who has been photographed stepping over her "did not provoke her fall: she was already on the ground." The police's attempt to disperse the protesters which led to Legay's fall "could not have surprised anyone", he said, because "several actions" to break the crowds had already taken place before this one.